WASHINGTON -- Stepping back from a campaign promise, President Donald Trump on Thursday decided not to move the U.S. embassy in Israel to Jerusalem, at least for the next six months. The White House described Trump's waiver as a move to improve chances for an Israeli-Palestinian peace deal, but the relocation also risked igniting tensions across the Middle East. Although Trump's move keeps the embassy in Tel Aviv for the foreseeable future, the White House said the president wasn't abandoning his repeated pledge to move it. Press secretary Sean Spicer said Trump was merely delaying the move while the administration tries to advance a new peace process. Of the embassy, Spicer said, "The question is not if that move happens, but only when." The decision is a blow to Israeli hardliners and their supporters in the U.S., who had hoped Trump's presidency would shift the U.S. toward a fuller embrace of Israeli priorities. The Jewish state has long urged the U.S. and others to build embassies in Jerusalem, to reflect Israel's claim to the holy city as its capital. But since taking office, Trump has heard repeatedly from foreign leaders and Mideast experts warning him that such a move could terminate his push for a Mideast peace deal even before it gets started. The longstanding U.S. position is that Jerusalem's fate must be worked out through Israeli-Palestinian negotiations. The Palestinians argue moving the embassy would prejudge one of the most sensitive issues in the conflict, undermining America's status as an effective mediator. Trump had been up against a Thursday deadline to either certify the U.S. had opened an embassy in Jerusalem or see the State Department lose half its funding for overseas facilities. Congress passed the law in the 1990s. Under pressure from Arab leaders and others, Trump followed the lead of past presidents of both parties who have waived the law in six-month stretches. Jerusalem's status is one of the most emotionally charged matters separating the Israelis and Palestinians. Both sides stake claims. Israel captured east Jerusalem - claimed by Palestinians for the capital of a future independent state - from Jordan in 1967 and annexed it, in a move not internationally recognized. Trump had been lobbied heavily by Mideast leaders, notably Palestinian President Mahmoud Abbas and King Abdullah II of Jordan, to sign the waiver to prevent further instability and unrest in the region. Abdullah in particular expressed deep concern that moving the embassy would spark unrest among his country's large Palestinian population. 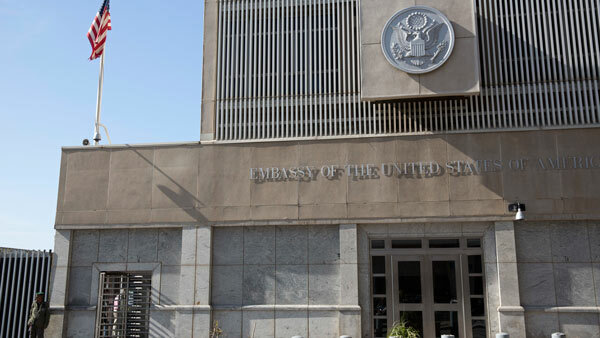 U.S. officials say the process of moving the embassy would take at least six months and involve major adjustments in security, office and housing space and staffing at both the existing facility in Tel Aviv and the consulate general in Jerusalem. Building a new complex in Jerusalem would take even longer.